One of my favorite side dishes to make is portabello mushrooms sauteed with some white wine, garlic, pepper, pine nuts, and green onions. I had some left-over Quinoa after making my sons lunch, and decided to make my favorite side dish into a healthy meal by cooking the quinoa with some peppers and serving it under the portabello mushrooms! Enjoy! To Prepare Quinoa: Wash the quinoa in cold water and drain. Cook the quinoa in a rice cooker or pot of boiling water. Heat a non-stick pan to medium-high heat and add some olive oil. Fry 2 cloves garlic until fragrant. Add the bell peppers and cook for 5-10 minutes, stirring frequently. Add the quinoa, salt, pepper, and garlic powder. Cook for another 5-10 minutes while stirring frequently. Do not let the quinoa burn. To Prepare Mushroom Mixture. Wash the portabello mushrooms and remove the stems. Slice each mushroom in thin 2 inch strips. I usually thinly slice the mushrooms in one direction and then slice in the other direction in quarters. Heat a non-stick pan to medium heat and add about 2 T olive oil. Fry 2 cloves garlic until fragrant. Add the mushrooms. Saute until the mushrooms are thoroughly cooked and all liquid has burned off. The mushrooms should start to lightly brown. If you need, add more olive oil to keep the mushrooms from burning. Add the white wine, pine nuts, salt, pepper and mix for an additional 3-5 minutes on medium heat. Set aside. To Serve. 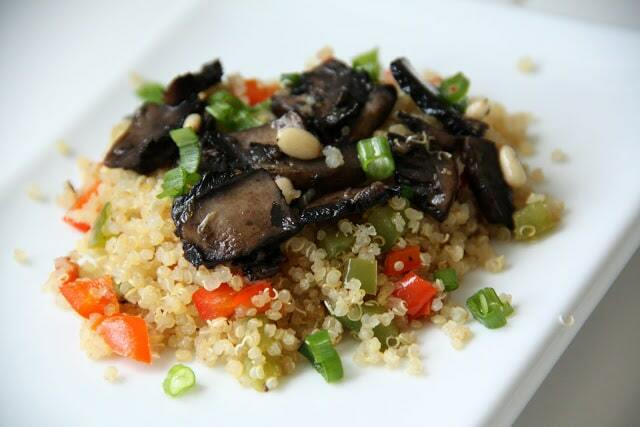 Place a portion of the quinoa on a plate and top with the mushroom mixture. Garnish with chopped green onions and serve warm.